Editor Kishore Te passed away! After he gone through two surgeries for a blood clot in his Brain, Kishore Te passed away on Friday [March 6]. Home » Dead | Kishore » Editor Kishore Te passed away! The National Award Winner editor Kishore Te has breathed his last a few minutes ago in a private hospital in Chennai. Editor T.E Kishore, who was undergoing treatment for a brain stroke, breathed his last on Friday at a hospital here, said a family source. 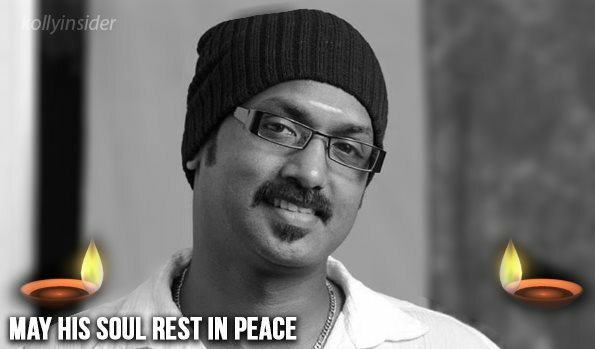 As KollyInsider reported viewers earlier, Kishore Te was in critical condition from past few days. Kishore was 36 and died at the Vijaya Hospital. He is survived by his parents. “Kishore was hospitalised few days ago after he suffered a brain stroke while working in a studio. He slipped into coma and failed to respond to the doctor’s treatment,” a family source told IANS. Born on 24th March, 1978, 36-year-old Kishore Te , who started his career with 2009 critically-acclaimed Tamil thriller “Eeram”, was the former associate of renowned editor B. Lenin. In 2011, Kishore pocketed a National Film Award for his work in Dhanush-starrer “Aadukalam”. He is also known for his work in many blockbuster Tamil films like Aadukalam, Mappillai, 180, Engeyum Eppothum, Kanchana, Aarohanam, Dhoni, Ethir Neechal, Udhayam NH4 and others.. He has over 30 films to his credit.